By hiking a repo rate RBI has taken a lot of risk. While it tries to ease down inflation, consumers will face the brunt of this hike. The Reserve Bank of India (RBI) has given an open invitation to banks in freely hiking their lending rates on home loans, auto loans and personal ones as well. The central bank has set a new table by raising policy repo rate by 25 basis points for the first in the Narendra Modi government’s reign of four years. RBI had no option but to take policy repo rate at 6.25% from previous 6% due to higher crude oil, MSP hike and 7th Pay Commission which are hampering their CPI inflation target in future. Now this hike in repo rate would give further chance to lenders in raising their MCLR which will in return mean any loan taken would make you pay higher EMIs. Many banks both state-owned and private ones have already started raising their benchmark lending rates, which is a bad news for consumers. As the benchmark Marginal Cost based of lending rate (MCLR) is directly linked to Repo Rate - therefore any increase in repo rate will lead to increase in MCLR. Such would in return lead to rise in interest rate for borrowers who have taken floating rate home loan, personal loan and business loan. If you have loan or are planning to borrow from the below mentioned bank than your EMI is set to rise. So far these banks have raised MCLR in the range of 5 basis points to 140 basis points. Largest lender State Bank of India (SBI) was first to not shy away in raising MCLR by 10 basis points to 8.25% for a tenure of 1 year from previous 8.15%. Other banks followed suit. Currently, ICICI Bank and HDFC Bank are charging MCLR rate of 8.40% each for 1 year tenure. 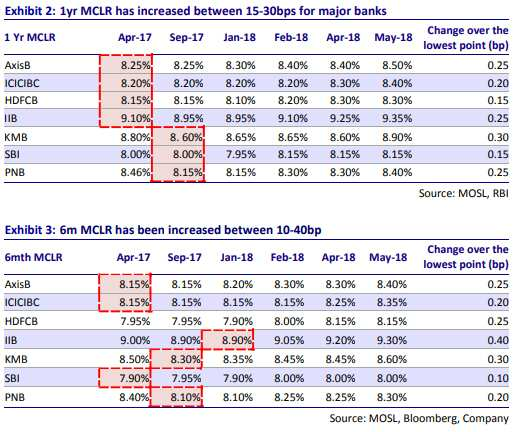 Meanwhile, banks like Indian Bank, Punjab National Bank, Bank of Baroda, Syndicate Bank and Bank of India have raised MCLR for 1 year tenure to 8.50%, 8.40%, 8.45%, 8.55% and 8.50% respectively. On the other hand, Oriental Bank of Commerce and Karur Vyasa Bank have raised MCLR highest to 8.65% and 9.30% for a tenure of 1 year. 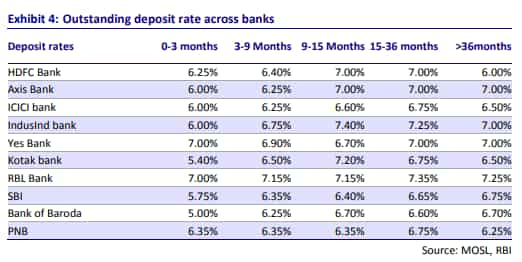 Higher lending rates is a good news for banks because that is their main source of income but bad news for consumers because they are ones who will pay higher interest rates. An EMI is a fixed amount of money that a borrowers needs to pay on a monthly basis to lenders or financial institutions, towards the loan amount they have taken. Apart from raising policy repo rate, RBI boosted lending for affordable housing in Pradhan Mantri Awas Yojana (PMAY). It also warned banks regarding low ticket housing loans. It needs to be noted that, RBI has shown disappointment in banks way of rising MCLR earlier because the central bank believed that lenders are not giving in policy repo rate of 6% benefit to end consumers. However, now the tables of have turned. With RBI having a job to control inflation, the banks will see good credit growth of the back of higher lending rate, but consumers will be the one to face brunt of such an outcome.